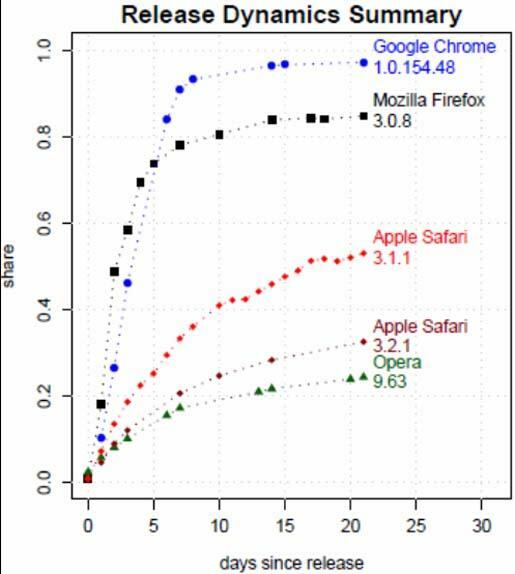 Google Chrome Proves That Most Effective Browser ! If you are using google-chrome-comes-with-real-player-in-bundle/">Google Chrome browsers means, you have become stress free. Because last week a paper published that “Why Silent Updates Boost Security” says that Google Chrome has the most how-to-view-the-pagerank-and-alexa-rank-in-google-chrome/">effective mechanism. Its updater works automatically and it needs no user’s interaction. If you need to disable the updater, you can do it. 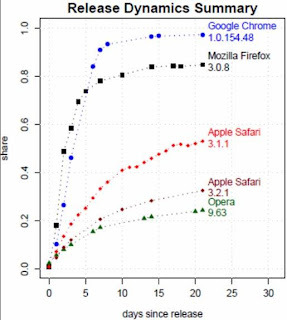 The report says that 97% of the Chrome users had the latest version of the browser 21 days after its release, compared to 85% for alertfox-lets-you-monitor-your-website-in-high-technology/">Firefox and 53% for Safari. how-to-disable-thumbnails-in-new-google-chrome-window/">Want to disable thumbnails in Google Chrome ? Moreover, Chrome screenshot-of-google-chrome-for-mac/">checks for updates every five hours, therefore no update you will miss. New updated open source component code-named Omaha is being used in Google Chrome. If there is any update found in thefirst-six-core-chip-processor-from-amd-gets-ready/"> server, the client will automatically download and install it in the background without prompting the user. As soon as you restart the browser, thegoogle-chrome-theme-in-firefox-chromifox/"> update will be activated.